Hotline Tip: Can I Still Use My Outdated Stamp For Notarization? If my commission has been renewed but I do not yet have a seal with the new expiration date, can I use my current stamp, strike out the old date, and hand-write the new expiration date? While the law requires that every Notary shall include on each act, instrument, or attestation the expiration date of the Notary’s commission as a Notary public, there is no state statute forbidding you to strike or block out the old date and hand write your new commission expiration date. 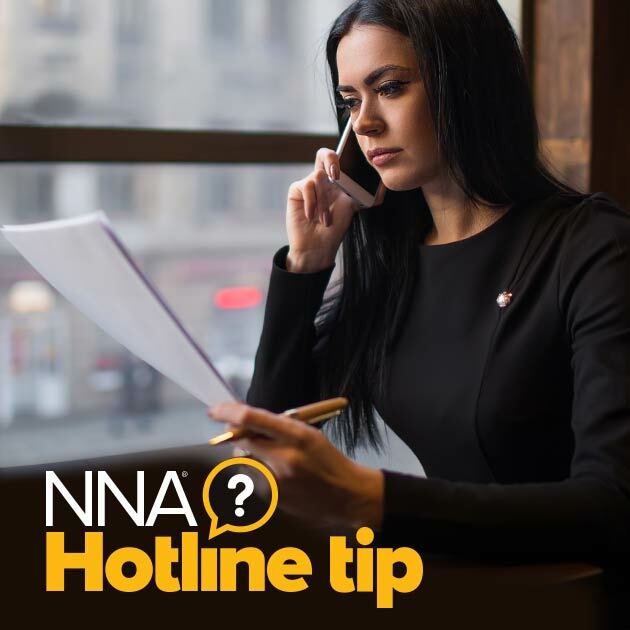 However, it’s not a practice the NNA recommends, as the receiving agency may question why the date has been changed, who made the change, and whether or not the Notary’s commission is still active. Such questions could delay or even invalidate the notarization. We recommend ordering a new stamp featuring your commission’s updated expiration date. My commission is about to expire and I have received the new commission can I start using it even if I have 7 days for the old one to expire? Can you tell us what state you are commissioned in, please? same question as above; notary expires 6-11. No stamp yet. will be notarizing documents this week. Hello. So that we can answer your question can you please tell us what state you are commissioned in? I have renewed my notary in the state of Virginia however my existing notary does not expire for two more months. If I receive my new seal before my existing one expires, is there a preference which expiration date to use? I lost my current Notary Stamp and have my old one. Is it okay if I strike out the old expiration date and hand write my new one and initial the date on the side? I'll currently in the state of Illinois. Hello. No, the Illinois Notary Public Act requires that the expiration date be imprinted on the seal. This date may not be handwritten. I have a renewed commission in MD but my new notary stamp hasn't arrived yet. May I use my old stamp and cross out the old expiration date until the new stamp arrives? I have received 2 notarized affidavits, same notary public from California , same commision number and two different expiration dates. One June 2019 & one expires July 2019. How or why would one notary public lady have two different expirations same year? I've already sent a complaint due to the signature not matching her oath signature. if I notarize a document and by mistake I used my expired stamp, may I re-stamp the document with my current stamp? Hello Diana. To help us answer your question, can you please tell us what state you are commissioned in? I have not yet received my updated notary stamp, but can i still use my current one on THE DAY it expires? It expires the 17th, can I use it on the 17th?